Perfuse microliter volumes of precious solutions. Deliver microliter volumes starting with as little as 100 microliters of precious drugs. Switch between eight solutions in milliseconds from a single tip. Minimize cross-contamination with BackStop™ back-flow prevention. Special 3-way relief valve design stops liquid flow quickly. Valves and pressure controls in a small box near microscope – no stand necessary. 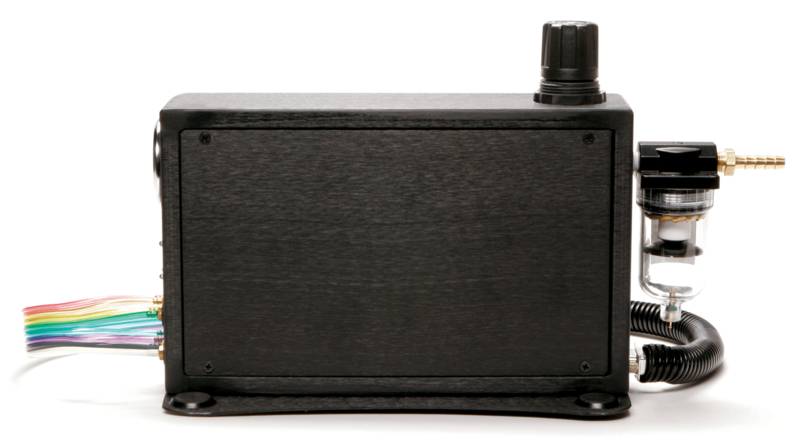 Includes pressurized large-volume reservoir for buffer. 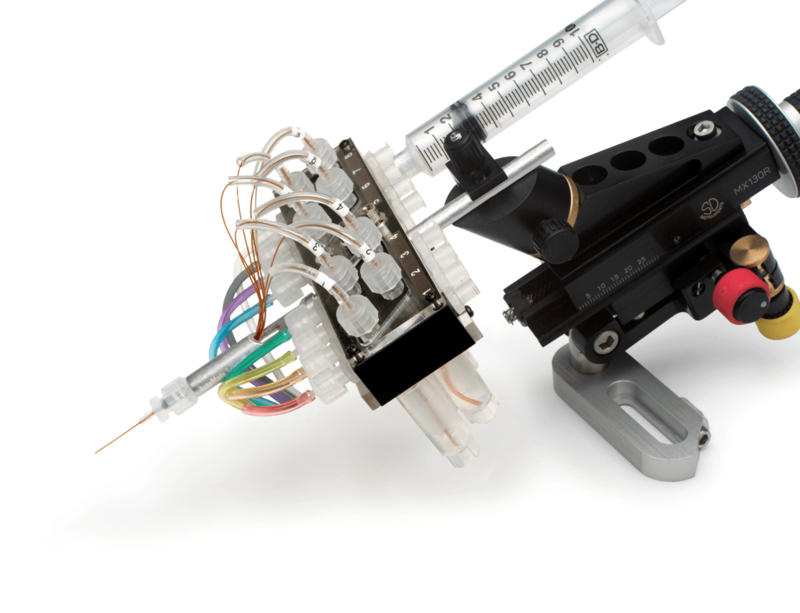 Programmable dispensing, microinjection, perfusion or spritzing of reproducible microliter volumes. Up to eight solutions are stored in 2.5ml cryo tube reservoirs with easy syringe refill ports. Included pneumatic solenoid valves deliver regulated air pressure to push liquids out of the Smart Squirt Perfusion Pencil tip. 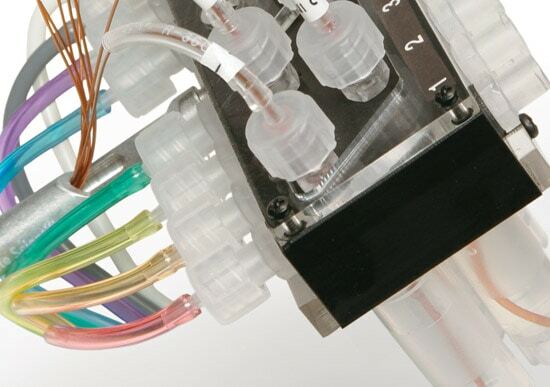 An AutoMate Scientific (or other) valve controller offers programmable, manual or computer-controlled valve selection for switching which reagent is delivered from the tip. Pulse a valve quickly for microliter delivery, or leave it on longer for constant perfusion. The short delivery path saves expensive reagents. Integrated BackStop check valves prevent backflow found in competing micro-perfusion systems, while special three-way valve design stops liquids quickly. The 0-10psi regulator and air filter require a compressed air or other gas source — bottle, compressor or lab air. Compare to an eight-channel, 10psi Picospritzer™ at a fraction of the price. 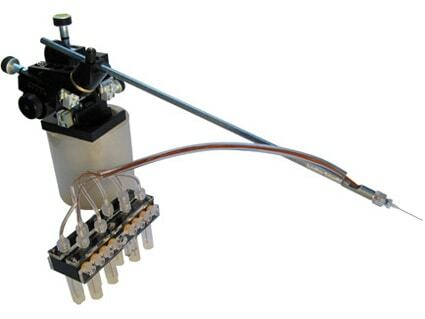 Order with an AutoMate ValveLink8.2® or ValveBank® controller or use your own valve controller. 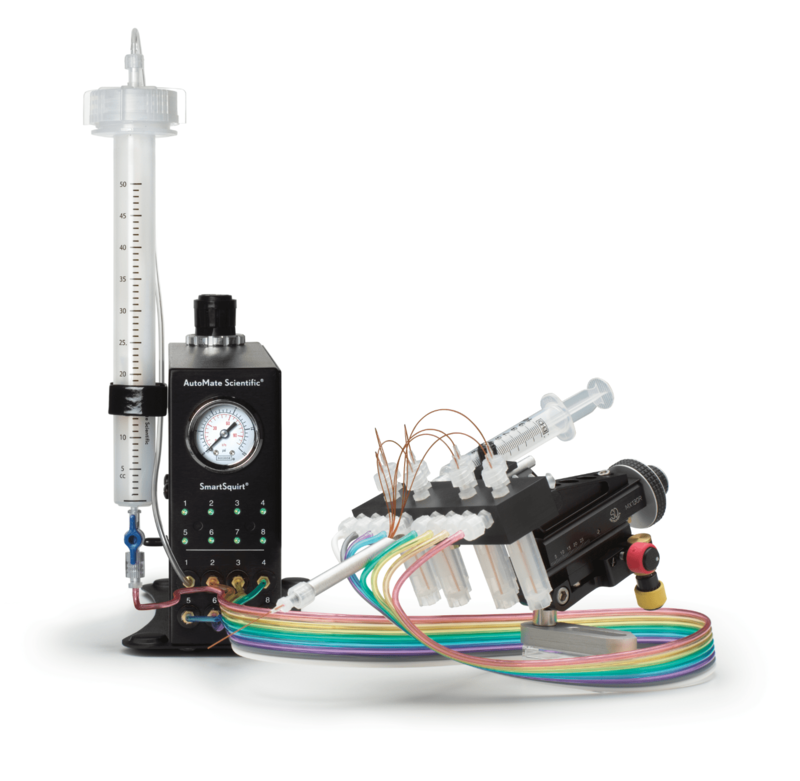 Can be combined with an AutoMate Scientific ThermoClamp® for temperature-controlled delivery. Micromanipulator packages available. No room on your microscope stage for the SmartSquirt The Perfusion Pencil for the SmartSquirt now uses longer tubes for mounting the Reservoir Block up to 30cm away from the delivery location. The Pencil itself is also 30cm long for easier mounting on wide stages. Both standard. Precision pressure regulator and 5 micron filter are built-in. One-way check valves inside the reservoir block prevent liquid backflow from the tip. Uses standard cryo-tubes as reservoirs. Easy ports for refilling reservoirs.